This week’s topic is something that has truly served me in my life and business and so I think it is super important that I share this with you! If you’ve been around for a while, the concept of your future self isn’t new, but I’m going to show you how to really tap into her in the present. We’re all familiar with the idea of hindsight and don’t we all usually look back on a situation thinking we could have done it better? Well, what I’m exploring today is the fact that you can have hindsight ahead of time. Even though we all go through times in our life and business that are tough, understanding this concept and practicing it can bring forward feelings of gratitude and appreciation for you right now! Tune in this week for my insights on your future self and how you can access her thoughts and feelings even in the most difficult situations! This concept changed the course of my business and I am so excited for you to do this work and transform your life! Hey, girl! If you’re ready to work with me to grow your business, I want to tell you about my new program, Mango Magic Business Academy! We’re going to combine mindset, action, business strategy with mastering the belief and being in the energy of the person who has the results that you want. See you there! How I was able to feel gratitude when I first started my business but wished I was further along. Why you can have hindsight now. How you can have fond feelings and experiences about a situation you might be in. 5 questions that will help you have hindsight in the present. An exercise that will help you access your future self. Hey guys, how are you? I hope you’re having a wonderful day. I know this is going to be going out on a Wednesday. Can you believe that it’s already like, the end of September? Like, what is happening? Just blows my mind. Before we know it, there’s going to be snow on the ground, and I must admit, I kind of like snow sometimes. My fiancé Chris will probably be angry when he hears this because he hates winter. But anyway, I just cannot believe it but I am super excited to talk to you guys today about what I’m going to share. And I was thinking about this the other day when I was talking to Chris, a lot of my inspiration comes from conversations with him and of course, all of my clients. But I was talking about this thing that I do that really, really serves me and I wanted to share it with all of you guys because you’re here to learn from me and learn from what I’m teaching you and learn how I think and how I’ve created the results that I have in my life and my business. And so I felt like this was something super important to share with you guys. So I talk a lot about future self, about tapping into like, already having the result that you want and the thoughts and the feelings and the things you would tell yourself from that place. 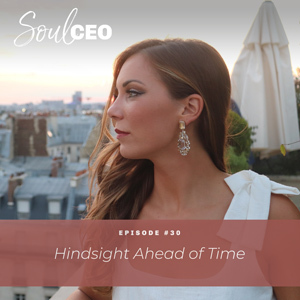 And I was talking the other day to one of my clients as well, and then after I was talking about this concept with Chris about having hindsight ahead of time. So do you guys know the saying hindsight’s 20/20? The thing is that that is of course true, right? Like, I’m sure you can all look back on something in your life and you’re like, huh, I could have done it a little bit better, I could have done it like this, I should have done it like that, it would have been smarter to do it this way, right? Like, hindsight is always 20/20. It’s easier being out of a situation and seeing it from a different light and how you could have done something differently or how you could have appreciated it in the moment or how so on and so on and so on. So the thing that I’ve realized is that you can have hindsight ahead of time. You can access the feeling of looking back and having gratitude and learning something and accessing knowledge in the current moment, and that’s where I think a lot of us struggle is we focus on all the things that are going wrong, we focus on the struggles, we focus on whatever it is in our current life, the things that we need to fix, and while yes, it could be amazing to grow to another level, there’s also an opportunity to look at it from a very different perspective. So what I want to show you guys is how to have hindsight ahead of time. And what that really means is accessing knowledge from the future and seeing your current situation from a different light. So I’m going to give you guys a perfect example of this. I remember when I was building my business and I had like, three clients and I was running around like a chicken with my head cut off, I must admit, and I remember just like, wanting to be further than I was. And I talked about this a little bit before in one of my previous podcasts about wanting to be further along than you are, but this is kind of another layer to that. And I remember coaching on it with my coach at the time and talking about how like, one day I was going to look back on that moment with a sense of pride, with a sense of kind of like, fond memories. And to see that like, that hustle, that grind, that part of my business was exciting and it created a sense of pride in myself and it was fun. And while yes, there were challenges, there was also a lot of amazing things about that part of my journey. And so in that current moment thinking like that, I was able to feel this sense of kind of gratitude and just appreciation for where I was and the fact that I was living in the moment of something I would look back on fondly, right? Have you guys ever done that with like maybe you have kids and in the moment – I don’t have kids but I can only guess – in the moment you’re like, kid is screaming and you’re like, oh my gosh, how do I do this, but then one day 20 years later you’re looking back even on that moment kind of fondly, kind of like, I remember when my kid was just losing their crap in the middle of Target and I didn’t know what to do and it’s funny, right? And it’s something that you remember. It’s a part of the experience. And the thing that I want to show you guys and tell you guys is that you can feel like that now. Just because you’re not out of a situation or years past it looking back on it, you can still feel that way about it now. So what I want you guys to do is I want you to think about something that like, you maybe aren’t totally happy with right now in your current life and maybe you’re on a journey to like, finding your dream man or creating your dream business or getting out of your job or whatever it is. I want you to think about something that you’re kind of on a journey but you’re not out of it yet. Like, you’re not like, looking back on it like, man, that was tough but here I am and here’s how I’m looking at it now. I want you to ask yourself, when you get out of this, when you reach the destination for this path that you’re looking to get to and side note, I don’t really know if I believe there are destinations in a good way. I think life is just a journey and all the areas of our lives are just this beautiful amazing journey. But I want you to think about like, when you do get to the destination or when you do get to that place that you envision being, what she is going to think about your current reality. Like, how is she going to look back on this moment and this thing that you’re not totally pleased and excited about and how is she going to feel about it? How is she going to look back at this fondly? How is she going to look back at this with a sense of pride? How is she going to be grateful for this journey that you’re on right now? What is she going to learn through the experience that you’re having right now? Right? Like, your answers to that are your opportunities to feel that way now. Another great example of this like, finding your soul mate, finding your dream man. And for me, I’m there. I’m marrying the most amazing man but I went through some bumps and bruises along the way. Sometimes dating isn’t always the most fun thing, although you can always pre-frame it or frame it that way to make it feel that way. But when I look back on dating, I look back at it so fondly. And in the moment, I actually did create a space that it was the most fun and exciting thing ever. But it’s easy when you are at that place of finding your dream man to look back on all the guys that broke your heart, all the crazy situations you were in to be like, oh my gosh, I see exactly why this happened. I’m so grateful it did because I wouldn’t be here without that, right? And the reality is you get to feel that way now even if you just had your heart crushed. If you trust and believe that you are going to get out of this place, if you’re going to find your dream man eventually, because the right guy would not crush your heart, then you know looking back on this moment, yes, it’s going to feel hard, yes, it’s going to feel sad, yes, you’re going to feel all these things but you’re going to see that there’s going to be so much you learn from it that helps you grow into the woman that you need to be in order to find your soul mate, that helps you learn and grow and gain independence that maybe you wouldn’t have without that. And you can access that now in the moment of pain, in the moment of sorrow, in the moment of struggle, in the moment of challenge. You can always do that. And that creates a totally different vibe and energy around it. Doesn’t mean that you just skip over it and pretend that it didn’t happen, but you can access a different level of awareness, a different line of thinking about your current reality even if you’re not where you envision going. Like, I look back on building my business so fondly. Now, I’m really grateful I am where I am for sure, but when I tell stories about the work and the getting up at 4:30 and the calls and the running around and grabbing my lunch box and having 20 different bags because I had 20 different places I wanted to go, I look back at that fondly. I look back at that with pride. So in the moment, and I truly did this in the moment when I was building my business, I was like, I’m a part of the girl boss club. I’m a part of the club that grinds it out, does all the things, juggles 50 things at once, like, that’s amazing. That feels really cool to me and I was able to access that in the moment, which allowed me to show up a lot differently than I would have if I didn’t have access to that. So I want to ask you guys how can you have hindsight ahead of time right now in your life? Maybe you’re happy with where you are but you want to be further along. Maybe you went through one of the toughest things you’ve ever experienced in your current life and it’s like you barely feel like there’s a light at the end of the tunnel. How can you have hindsight in this moment? How can you see that there’s something to learn here and some way to grow and some amazingness that’s going to come out of this? And what would you have to believe to like, have this hindsight, right? You’d have to believe that you’re going to get out of it. That’s another layer to this. You have to believe that you’re going to get out of this spot, you’re going to get to where you’re wanting to go eventually. Now, if you don’t, that’s another layer of work, right? What would you have to think to believe it? What would you do if you believed it? What can you believe? Right? Maybe you’re not sure, like, will I find my soul mate? I’m not really sure but I do believe I could find a really happy relationship. Use that. What does that version of you think looking back on your current moment? You have the ability to completely shift your vibe and completely change the way you’re looking at a situation by having this hindsight ahead of time, and that is going to allow you to show up much differently when things go wrong, when things go right, when you’re not quite there where you want to be and experience where you are in a totally different way. Because if you’re going to experience it fondly or in a good way in the future, why wouldn’t you just experience that now? Because you can. And you can access that. The other thing that I will assign to you guys as homework if you want to take this work a little bit deeper is sometimes I’ll write a letter to myself today from my future self who’s out of the situation she’s in right now or who’s “made it” and I will ask like, I will write about what does she want to tell me. Be open to learning, be aware that this is also going to be an amazing part of your journey. That is such a powerful exercise to do. So if you guys do that, I would love to hear about – also, I love that you guys tag me in your stories when you listen to my episodes. Keep doing it. I try to share them on my story as well and I will continue to do that. I love the support, I love the love because I want to get this message out to as many women as possible. I know they need this work and when you’re doing it and when you’re participating in your growth and sharing it with the world, it creates a ripple effect. So I’m so excited that you’re here and I hope you have a wonderful week and I will talk to you guys soon. Hi guys, so really quick, I wanted to make sure you knew about the next program that I’m offering right now. So many of you guys have been reaching out to me and my team and asking what is available to you, how can you grow more through working with me, and this is my next big thing. I have poured my heart and soul into creating it and I’m so excited to share it with you guys. So one of the things that has made me so successful in business is the combination of mindset, belief, and action, and pulling all three of those things together into one. Like, I literally call it my magic, it’s my gift, and it’s what I powerfully do for my clients in their businesses because we can’t just have mindset and not take the action or not have the belief, and we can’t just have the belief but not take any action or not have our mindset in the right place. Or you really can’t just take action and have your mindset out of whack or have your belief off. So it really takes all three things to grow your business to that level, to that vision that you know is possible for you. So so many of you guys listening, I know you have this vision in your heart and in your mind for the business that you want to create and you feel like you have the potential and you know that it’s possible for you, you just need something to take it to that next level. That’s what my Mango Magic Business Academy is all about. There’s a version of you who already has what you desire. The journey isn’t about becoming her, it’s about unbecoming everything that tells you you are not her. And that’s what this program is about. Combining mindset, action, business strategy with mastering the belief and being in the energy of the person who has the results that you want. So if you’re interested in that, make sure to click the link in the show notes and it will lead you to a page with all the in-depth information about what the program is, how long it is, how much the investment is, and it breaks down what we will be teaching on and talking about. So I’m so excited and let’s make some more magic happen in your life and business. I’ll talk to you guys soon.